Help Documents - Version 5 Banquet Table WizardHow do I turn on Banquet Tables? If you are conducting a fundraising event and are selling tables and table seats, this tool will help you manage your donor seating and funds received. 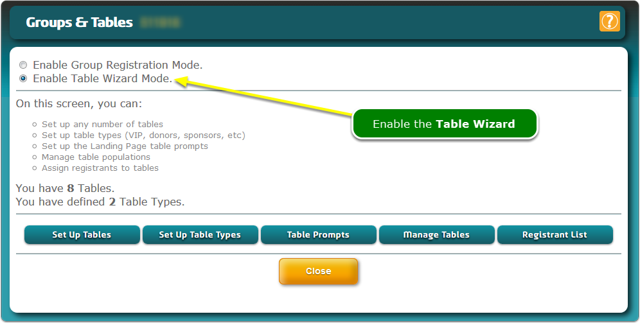 The Table Wizard allows you to set up tables that can be managed by Table Captains. Registrants can purchase individual seats or an entire table. An entire table can be populated by the Table Captains. Table members can be moved from table to table. NOTE: Using the Table Wizard is NOT compatible with Group Registration and Registrant Types. You cannot use both table registration and group registration simultaneously. Click the check box to turn on the Table Wizard. Confirm that you want to turn on the Table Wizard. Doing so will disable Group Registration and Registrant Types. 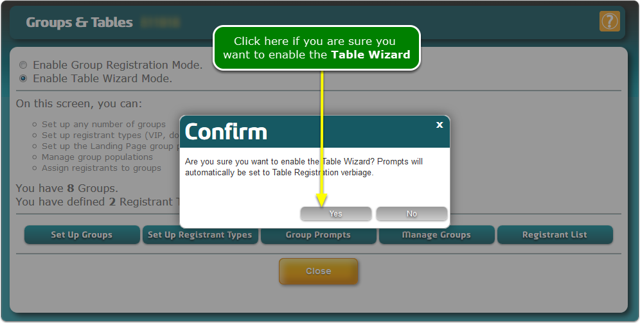 Conversely, if you turn on Group Registration, then the Table Wizard will be disabled. The Table Wizard and the Group Registration tools share the same prompt fields on the Landing Page. This is why they cannot be used simultaneously. Use this screen to setup and manage your tables. Set Up Tables - set the number of seats per table, the total number of tables - How do I set up Tables? 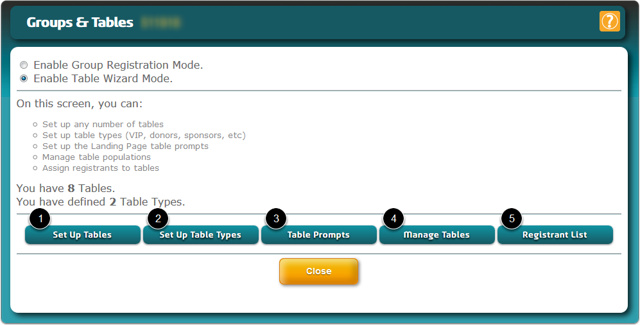 Set Up Table Types (VIP, donors, sponsors, etc) - if you have table types (optional) - How do I set up Table Types? Set up the Landing Page Table Prompts - How do I set up Landing Page Table prompts? Manage Table populations - move people into and out of tables - How do I manage table registrants? Assign Table Seats - use the Registrant List to assign people to certain tables with the bulk editor - How do I assign registrants to tables? Prev: Where do I access the Table Wizard? Next: How do I set up Tables?